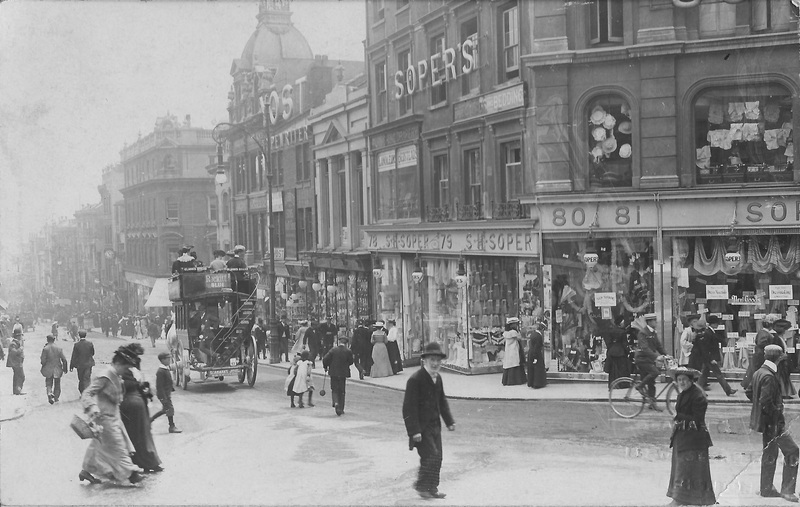 This postcard of Soper’s in North Street was recently discovered by my brother-in-law Derek Green when he was sorting through some old family papers. There’s already a page on Soper’s you can see it here I was going to ask Jennifer to add the photo to that page, however after I scanned it, quickly it became clear that it really warranted a page of its own! If you click on the image to enlarge the photo, the detail is amazing. I’m sure we will all have fun examining it and adding a comment. It may not be clear on the photo, but embossed in the bottom right-hand corner is the name and address of the shop that sold the card; Seaman & Sons, 184 Western Road, Brighton. Happy Easter everyone, have fun!! What a fabulous photo. Thank you very much for posting it, Peter. The detail is fascinating. What a vibrant photo, full of movement, doesn’t look as though anybody has posed for this, just a lovely snapshot of the day. I wonder about the size of the negative or the speed of the film, not much blurring at all. Look at the lovely old couple looking at the camera. A great image! 184 Western Rd in the 1914 Kelly’s was Van Trolga, photographer, so this card is in line with that enterprise, but I would guess the image above is earlier with that horse bus in the road. 184 became in the 20th century part of Woolworths. I love this photo. I could look at it for hours (and have). I’m having trouble dating it precisely, but would say it’s very late 1890s to very early 1900s. That’s going purely by the ladies’ fashions. Big leg-of-mutton sleeves and balloon sleeves had gone by 1900, and skirts were very narrow and shorter by 1910. I’m no expert, though. The only person who seems to be posing is the man on the horse bus. Perhaps not for the photo but just for people to notice him. I love these sort of photos. All of those people were living out their lives and probably their concerns were much the same as ours. They had relationships, worried about money, went to the shops and so on. It would be wonderful to step into this photo for perhaps an hour. I have looked at this photo a lot. Thank you. What is the man to the right of the two small girls carrying? Seems to be a ball on a stick. Some things I noticed: Clark’s Bread, I wonder what year they started? Reckitt’s Blue, laundry powder I think. Can’t think what that guy is holding, looks like a ball on a chain. Horse muck in the road, I think kids used to collect that to sell to keen gardeners. Obviously summer time and a dry day, those dressed would get the bottom wet if it rained. Sun shades and “new goods” for sale in Soper’s. Hats were in fashion, everyone has them except the two girls. Beautiful stonework all down North Street. More horse drawn traffic further down North Street. The sign Yost Typewriter, I can confirm the year must be after 1888, when they started production. Beautifully clear and naturalistic. One can sense the bustle, but I could imagine there being little approaching the decibel levels of today. The gas lamp has quality and elegance not replicated in the overcrowded versions of Queen’s Road. The window displays are incredible. Perhaps the man is carrying a ballcock float and arm? Correction : I think it might have been early electrical street lighting, not gas. I wonder what Sharman’s of Western Road sold? Most people are wearing hats and quite a few are boaters, suggesting it might be a summer photo. On the top floor of Soper’s there is a display of women’s hats but I think they may be ‘mob caps’ worn by maids, waitresses and so on. The photo was taken at 11.15. Eleven fifteen in a moment of all these people’s lives. I know nothing about cameras but what sort would be used to take a photo like this? Would it take quite some time to set up have the image in your camera? Anyone any idea when it became Horne Bros? Sharman’s is listed in Kelly’s 1914 as ‘AG Sharman milliner & fancy draper 95,96,96a & 97 Western Rd &1,2 & 3 Western Terrace’. Older readers of this may remember the building as Plummer Roddis (now largely the Taj oriental grocery). Thank you for providing the link, Janet. Following some research, I’ve since learnt that “arc lamp” would have been a more appropriate term for me to have used. Local historian and Brighton & Hove Herald contributor W. H. Attwick provided some fascinating information from his work “Jubilee of the Corporation” (1904). The Hammond Co. were pioneers of electrical supply, with a generating station at Messrs. Reed’s Foundry in North Street. The town’s earliest electrical street lighting – some only of a experimental nature dating from 1883 – was powered from there “[…] the first instance in England of electricity being generated off the premises supplied, and being conveyed for general consumption from a central generating station. So that to Brighton belongs the distinction of introducing, not only the first electric railway, but the first system of public electrical supply, as distinct from a supply generated direct from machinery on the consumer’s own premises” (p. 130). The following page reveals that with the inauguration of the Corporation Works in 1891 (a nice coincidental link to the photograph here), the Mayoress, Mrs. S. H. Soper, turned on a switch that lighted lamps at the premises of the Mayor, Alderman S. H. Soper, “at the Emporium at the top of North Street”. Attwick too states that the North Street electric street lighting (along with that of many other main thoroughfares of the town) had been completed by 1896.